It’s the Summer Solstice today – longest day/shortest night. If it isn’t already obvious from past postings, I really like the solstices and equinoxes. It is something about their oppositional balance that I find appealing. 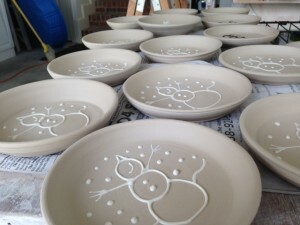 So, on this first official day of summer, I spent most of it in the studio working on snowman plates. It was purely coincidental that what we were working on Christmas-themed pots today. However, we struggled last year to keep up with the requests for Christmas plates because we didn’t start making them until September. This year, I am determined to avoid that craziness. In addition to that, Carolina Artists’ Colony (one of the stores that hosts our pots) is planning a ‘Christmas in July’ event that we will be participating in; so we have to get the plates done. We just finished the spring shows and our next show isn’t until August which gives us a bit of a break. The spring show season was a success. We had wonderful weather for all the shows, excellent booth locations, a great response from new patrons, and visits from many people who bought pots at past events. Our sales were excellent and many of the new glazes on our small bowls were well received. Shows are a lot of work to prepare for and to do; but, they are well worth it when we have such a response.